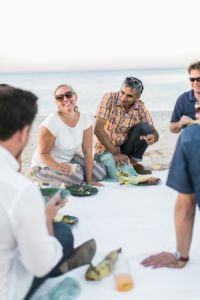 And tailor–made to affirm those feelings is a get-together on a warm August evening on a Lake Michigan beach in Sleeping Bear Dunes National Lakeshore. 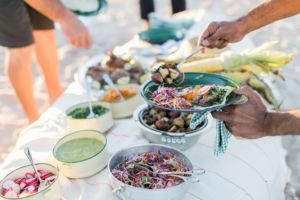 Cammie and Andy’s Epicure Catering van is parked on the shoulder of an obscure dirt road in the park, stocked with food and beverages for a sublime summer beach dinner with friends. The friends are arriving as Cammie pops open the van slider. They pull cars off on the sandy shoulder and get out to stand on the dusty road. They eye the van, size up the trail that traces through a white pine forest to the water. Cammie instinctually grabs a cooler and heads off down the path. The friends likewise hoist provisions and follow. You know what they are thinking: This is going be so much more than good. Down at the shore, Andy is drifting up in his red canoe, which he’d launched at a nearby road-end. The short paddle is a nice prelude to the evening ahead, but there’s a bigger purpose for the boat. Flipped over and nestled into the sand a bit, it will serve as tonight’s buffet table. The evening is now fully in gear. The friends emerge onto the beach carrying bags, baskets and boxes. Andy heads across the sand to an impromptu kitchen with a gas grill he set up just inside the treeline (to be out of the breeze). His girlfriend, Amber, wanders to the water, selects a smooth stone and skips it across the flat water that runs big and blue to the north horizon. The gathering is both elemental and elevated, and in that sense it is a perfect expression of the careers and the lives that Andy and Cammie have shaped for themselves. The two met in 2003 while working at Leland’s Riverside Inn. Cammie began working there as a teen dishwasher, but by the time Andy joined the kitchen, she was in college and had worked her way to line cook. The two hit it off instantly, a friendship bonded around a love for making great food and a shared approach to life: a serious work ethic and an equally serious play ethic. During her 20s, Cammie would head to Lake Tahoe for winter, where she’d teach snowboarding during the day and cook at night. When his season ended, Andy would do an annual 10-day fishing trip on the Kenai River, in Alaska, then spend the rest of winter moving other people’s yachts around the seas. “Nobody should be feeling sorry for me,” he says. He concedes they each lived their own version of a Peter Pan existence “… out of bags, out of cars, out of boats.” Andy settled down in his early 30s—he’s 43 now—but still loves to travel. Andy’s food story has always been connected to the land and water. He grew up on an inland lake north of Detroit, and his childhood home was near a couple of hundred acres of state forest. “We fished all the time, ate panfish all the time,” he says. And his mom was a gardener, so he grew up with an understanding of how dirt works and how lakes work and developed a respect for food and its connection to the earth. “It’s a cow and a rabbit and a bird and a plant, and somebody took a lot of time and care to make it your food. I was fortunate to be around that kind of idea my whole life,” he says. After high school, Andy accepted a rowing scholarship to Mercy Hurst College, in Erie, Pennsylvania, and soon found himself cooking for roommates and friends. “I’d shop the farm stands, find the good, cheap stuff. Sometimes friends would give me turkeys and hams and ask me to cook them.” Bonus: In the dating realm, he knew he had a clear advantage over guys who didn’t cook. College summers, Andy worked at Leland’s Bluebird. “I got my food education there,” he says. “We had a good leader, Chris Telgaard, and he knew a lot. 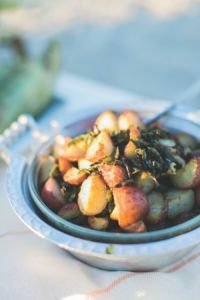 But he also knew he had four of us in the kitchen, all in our 20s, who were into it, and he let us go for it, we educated each other.” Telgaard’s overarching decree was they could make anything they wanted as long as they could sell it. Eventually Andy decided he was going to leave the restaurant business and start his own catering business and he asked Cammie to team up. Thinking back to those first jobs catering with Andy, she says, “It was very casual at the time, just, ‘We will work together this summer.’ I did not know at the time it was some life road I was mapping out for myself.” From the start, their childhood food experiences helped them see the wisdom of focusing on fresh local produce, an anomaly back in the early aughts, when there were few farmers markets and no distribution system for food from local farms. The local foods movement was just dawning. “We used to have to drive around for three days to get all the ingredients,” Cammie says. But the two had each traveled, seen the food scene in many places, and they came to understand that, as Cammie says, “the stuff grown here was gorgeous and delicious and underutilized.” Turning to the local farm community for the freshest possible fare became a cornerstone of Epicure Catering, and has remained so. Beyond the farm community, the two found community in other ways too. Thinking back on those early days, Cammie says, “People made a concerted effort to give us work—friends, parents, people in our community—and I don’t think I realized it at the time what that meant. 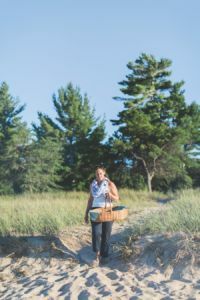 But now I realize that because of their good graces, we are where we are.” One friend, Laura Diebel, at Shady Trails Camp, offered up her commercial kitchen. “We couldn’t have done it without her support and kitchen,” Cammie says. The early jobs were small cocktail parties and dinner parties. “But they were great training as far as hospitality goes,” Cammie says. 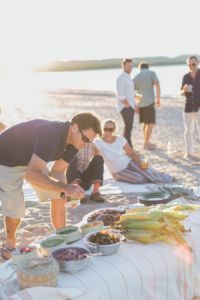 The events allowed Epicure Catering founders and their team to develop all the skills they’d need to scale up for larger events. 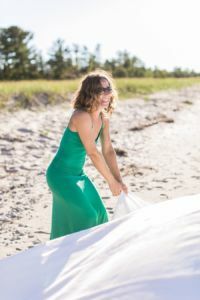 “The need to be clean, articulate, how to work deftly around home furnishings and guests, how to be creative in setting things up, mindful of wear and tear,” Cammie says. And developing a sense of intimacy while being professional—how to keep that kind of relationship when the invite list numbers not 12, but 200. Early on, too, they made another realization about the catering business, one that was more life-driven. 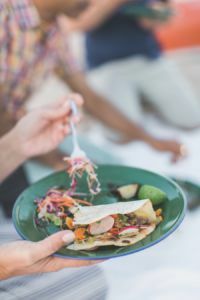 Unlike a restaurant, which has to be open year-round, catering allowed the partners to keep more control over their lives. “If we didn’t want to work for a month, we just wouldn’t schedule any jobs that month,” Cammie says. Or, more important, catering allowed them to shut down at the end of summer season and keep doing the things they loved. Andy could still fish with his brother in Alaska. Cammie could head West to snowboard. The beach party plays out as anyone would hope it would. The wind stays low, the air warm. Beautiful food appears on the upside-down-canoe buffet table. Salads of red, yellow and green. Flank steak tacos fresh from the flame. Cobbed corn tattooed with grill marks. 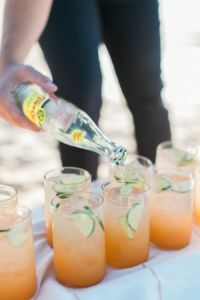 A translucent and captivating cantaloupe-hued cocktail that glows like the heart of summer (recipes below!). 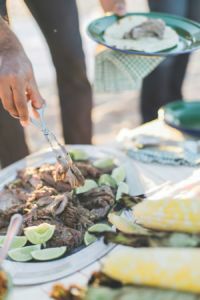 People settle on the white blanket and conversation quiets as flank steak tacos command everybody’s attention. In a bit, a friend stands, ambles to the waterline, picks a smooth, flat stone and skips it across the watery mirror, now reflecting the peach tones of twilight. “Make sure the food and drinks are good, and keep it simple. You will not be able to execute an intricate meal at the beach,” Cammie cautions. Do as much work as you can ahead of time. 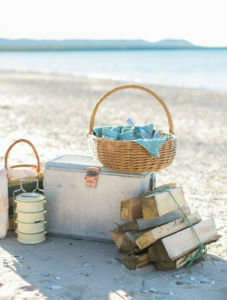 “Don’t bring a grocery bag of produce and a chopping block to the beach,” Andy says. 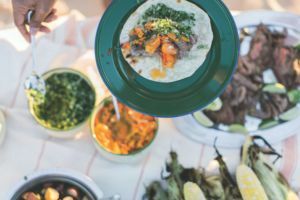 At home, marinate the steaks, assemble the salads (but don’t dress till at the beach), make the salsas. Be prepared to just scoop and serve. Three things to always pack: a lighter, a wine key, aluminum foil (good wind screen for the flame and versatile problem solver).